The fight over spilled milk. The modern grocery store dairy aisle is chaotic, with more choices than ever for milks, yogurts, and cheeses, sourced from cows, goats, and plants. The variety, though, can be confusing, particularly when it comes to milk. Research suggest people have the impression that soy, almond, coconut, rice, and conventional cow’s milk are equal substitutes for each other. But that’s not the case, and scientists at McGill University in Montreal set out to shed some light on the subject. New research, published in the Journal of Food Science and Technology, compares the nutritional values of four unsweetened plant-based milk products and conventional cow’s milk. The study concludes that cow’s milk beats all the alternatives—but among the substitutes, soy milk was the clear winner. The researchers analyzed the levels of fat, protein, carbohydrates, and calcium in an 8-ounce (240 milliliter) serving of each drink. While acknowledging that each beverage has pros and cons, the researchers concluded that conventional cows milk packed a more well-rounded nutritional punch than any of the other drinks. 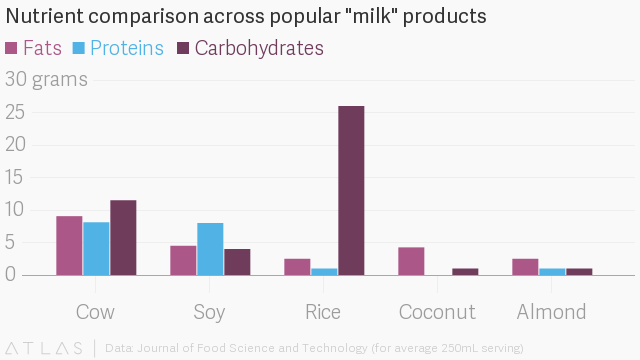 Coconut milk—which lacks any protein at all—came in last. 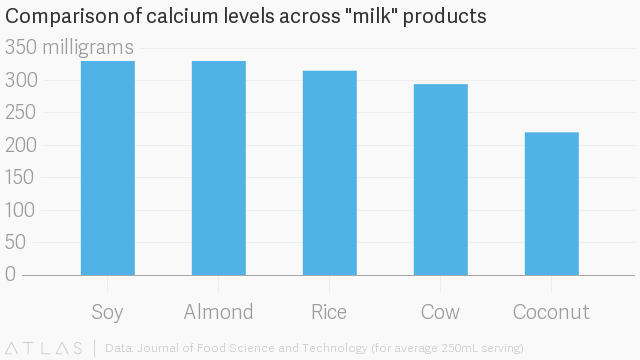 Surprising perhaps were the calcium rankings: cow’s milk—which for decades has been advertised as a go-to source for calcium—came in fourth, behind soy, rice, and almond milks. The research was made possible, in part, by a grant from the Natural Sciences and Engineering Research Council of Canada. The group has received funding from the Dairy Farmers of Canada, though there is no indication any of it went directly into the McGill study. The scientists behind the work report no conflicts of interest. Many people turn to plant-based alternatives to cow’s milk due to lactose intolerance. Plant-based alternatives are seen by these people as a way to get the nutrients they need while still keeping the eating and drinking habits they might have had with conventional milk—using it in cereals, smoothies, and as a drink on its own. Others give up cow milk for ethical reasons. The dairy industry, along with the rest of animal agriculture, contributes significant amount of greenhouse-gas emissions, which in turn are driving climate change. Many people consider the plant-based alternatives as a way to combat a looming environmental disaster. 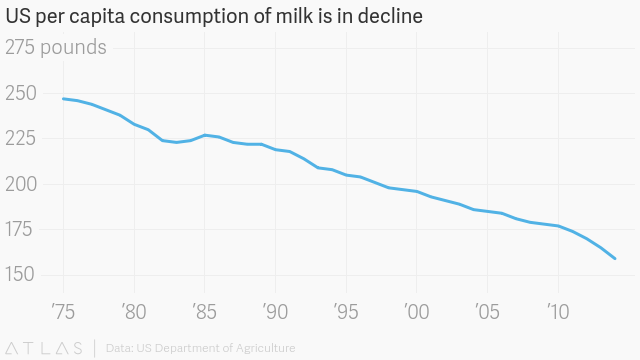 Whatever the reason, the data show many people are moving away from drinking milk. In the US, for example, per capita consumption of conventional cow’s milk has dropped precipitously over the last four decades—the government estimates by as much as 35%.